And it will be decided by people that Kevin Durant said this week "don't really know the game." The All-NBA team this season -- especially the third team -- truly carries more intrigue and substance than the Most Valuable Player or Rookie of the Year awards. Not in a historical context -- the winners of the biggest individual awards will get their moments to shine and be remembered much longer than any all-league roster. The All-NBA team isn't even bothered with at the annual award show. It's announced in advance without much fanfare like those technical Oscars that don't make the TV broadcast. It's decided on by 100 media members who cover the league and are selected by the league office. We are the folks who, like Durant says, don't really know the game. Be that as it may, we do know how important this task is. And anyone who gets a vote who doesn't understand the stakes here should be ashamed. One thing Durant -- and anyone else who might line up to take easy shots at the soulless media -- must admit is there's a reason the reporters and talking heads have to do it: because the teams, players and fans don't trust one another with it. The fan and player voting for the All-Star Game is such a compromised and haphazard mess of politics, popularity and chicanery that the league had to bring the media into that vote to act as the check-and-balance in recent years. Having the media vote for these annual awards is both imperfect and the best option available. There are two ultra-important choices coming on this year's ballot: who will get the third-team guard spots and who will get the third-team center spot. Those answers will swing fortunes. Here's why it matters. If Walker, who was voted in as an All-Star starter, makes the All-NBA team, he will hit the jackpot and become eligible for a supermax contract when he hits free agency in July. That would mean up to $220 million over five years if he were to stay with the Charlotte Hornets. If he doesn't make the All-NBA team, the Hornets' best offer could be roughly $190 million, a $30 million swing. And if he were to consider going to another team -- say, his hometown New York Knicks -- his limit would be four years and $140 million. A possible $80 million swing based on the judgment of those 100 voters. Just because Walker, who is having a career year at the perfect time, hits the mark doesn't mean the Hornets would make such an offer. But they'd be under pressure to do so, especially because Walker would certainly draw offers elsewhere. The Hornets are in a tenuous position: They would be expected to campaign for their player to be honored, but the accomplishment would hurt the bottom line. Thompson is in the same situation. He's having a fantastic defensive season and averaging a career high in points, though an early-season slump has pulled down his shooting averages a little. Also a free agent, he's not expected to leave Golden State, but making the All-NBA team comes with that $30 million in incentive if he wants a five-year deal. If he got there, it would potentially cost the Warriors tens of millions of dollars in additional luxury tax over the next few years. The Warriors gave the supermax to Curry two years ago. Thompson would have reason to expect the same treatment. No one would blame ownership if it secretly hoped Thompson would just miss out to Walker and it would be Charlotte's issue to deal with. Beal isn't going to be a free agent, as he has two years left on his contract. But if he makes All-NBA, he's eligible to sign a four-year, $194 million supermax extension this summer. If he doesn't make the team, he'd be able to sign for just three years and $111 million. He'd probably pass on that option and head toward free agency in 2021 instead. The Washington Wizards wouldn't have to offer the extension to him, of course, but after they did for John Wall after he made the All-NBA team two years ago, Beal would likely expect it. The bitter circumstance here is that Beal's candidacy for the All-NBA team is boosted because Wall went down. Wall might've been a candidate for an All-NBA spot had he not needed season-ending surgery in January, and his injury has cleared the way for Beal in some respects. 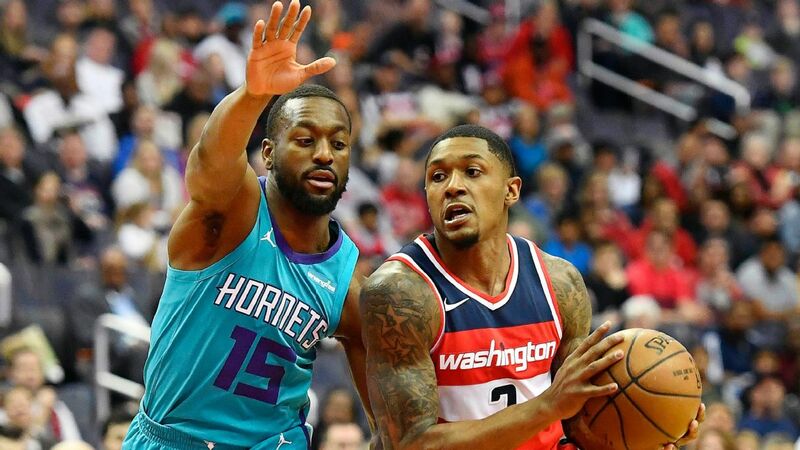 Beal has been playing the best basketball of his career since Wall left, averaging 30 points, 6 rebounds and 6 assists per game since the All-Star break. He's leading the league in minutes played, pushing himself to the limit as the Wizards head toward the lottery. Coach Scott Brooks has allowed it, playing Beal big minutes and outwardly supporting his growing case for All-NBA. "All in favor say 'aye,'" Beal said, surveying the group. That opens a spot for Towns, and it's not lost on him. Over the past 10 games, Towns is playing the best basketball of his career, averaging 33 points and 13 rebounds. Again, he can honestly say it's part of a (failed) playoff push. But Towns knows what's at stake. He has competition from players such as Rudy Gobert, Andre Drummond andNikola Vucevic. But for Towns, as with Beal and Walker, it will be up to the voters how much to weigh team success into the honor as none of the three is currently on a team in playoff position. All-NBA teams are picked by a global panel of sportswriters and broadcasters selected by the league office. There are three teams, and voters must pick two guards, two forwards and a center for each team. The NBA describes the position designation as the "position the play plays regularly." There is some room for interpretation there, and some years the league has agreed to accept votes for a player at multiple positions. In these cases, the players are slotted at the position where they received the most votes. The point system is five points for a first-team vote, three points for second team and one point for a third. The highest vote-getters in each position group make up the teams. Voters are selected with a couple of weeks left in the regular season, and the votes are due the day after the season ends. Votes are collected via a password-protection website conducted by Ernst & Young. A lot will be up to the voters. It's a significant responsibility. And it's transparent. All the voters and their ballots are made public. Guess we'd better start learning the game. AL HORFORD IS a vitally important player for the Boston Celtics. That's because of his leadership and experience, of course, but also because tactically he's a linchpin in their strategy against the Philadelphia 76ers. The Celtics, it is well-known, have dominated the 76ers over the past two seasons. Heading into tonight's meeting in Philly, Boston has won 10 of the past 12 matchups, including playoffs. Horford is a massive reason for it, because he might be the best defender in the league against Embiid. Embiid is shooting just 37 percent (28-of-76) with Horford as the primary defender, including the playoffs, according to ESPN Stats & Information research. That's tied for his worst field goal percentage against any of his primary defenders in the league. And this is no small sample. Horford has defended Embiid more than any other player in the league. The issue is that Horford has been bothered by a bad knee for much of the season. He missed seven games with a sore knee in December. He has played through pain at times because the Celtics have been thin at center with Aron Baynes also dealing with injuries. If/when a Celtics-Sixers playoff redux takes place, the health of Horford's knee could be one of the most important factors in the series. It's not something that's lost on the Celtics as they balance battling for playoff position against Horford's long-term health in the postseason. Their offensive engine this season has been the combo of Westbrook setting up Paul George, though George has gone into a shooting slump. Since the All-Star break, George is shooting just 38 percent overall and 32 percent on 3-pointers. He was a strong MVP candidate before this downturn, in large part because the Thunder were 11.2 points better with George on the court. Over his past 11 games, though, that number has reversed stunningly and the Thunder have been getting outscored by 2.6 points per 100 possessions. George missed three games in late February and early March with a sore shoulder, and it seems like it's affecting him. It doesn't get any easier for the Thunder in the short-term, as they play their next two games against the Toronto Raptors. Next week they start a five-game homestand that will be vital to establishing playoff position. But more important than anything is for them to get George performing at an MVP level again.